After the truly amazing celebration of our 16th year of techno space travels, we are very proud to announce our next edition with again several international names that are bright, shining stars on the techno firmament. 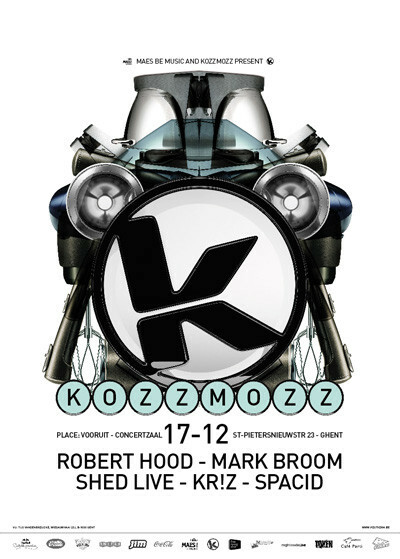 Robert Hood needs little introduction. Founding member of the legendary group Underground Resistance as a ’Minister Of Information’ with ’Mad’ Mike Banks & Jeff Mills, his seminal works on Jeff Mill’s Axis and his very own M-Plant imprint paved the way for a wave of stripped-down dancefloor minimalism that directed much of techno’s path throughout the late Nineties. Robert Hood makes Detroit techno with an emphasis on soul and experimentation over flash and popularity. Having recorded for Metroplex, Jeff Mills’ Axis label, as well as Patrick Pulsingers ’Cheap’ label, Peacefrog, and more recently Music Man, Hood also owns and operates the M-Plant imprint, through which he’s released the bulk of his solo material. He has only released 2 ever CD mixes one for French label Logistic, and a mix for the club ’Fabric’ mix series. For Mark Broom, it all started in the summer of ’89 when influenced by the Acid House era, he decided to try his hand at making music. He released his 1st record on General Prod. in the early 90´s. In ‘94 he established the Pure Plastic label together with Dave Hill. With his productions and excellent dj sets he made himself a name in the techno hall of fame. Under the name „Rue East” he established a banging live pa with Dave Hill. They recorded more than 10 EPs and two albums. Mark’s newly launched imprint "King Of The Snakes" is now well into its 10th release and has a very bright future, Pure Plastic records just broke the 65th release barrier, has a Rue East album in the pipeline and some very strong releases coming up so this will be another fine year for Mark Broom. Shed is a man of action, a living example how to reinvent oneself again and again within the boundaries of electronic music. At the same time, Shed does not follow shallow trends. The Berlin-based producer firmly believes in the power of techno music and is a techno kid through and through. His second album ‘The traveller’ on Ostgut Ton is not about the cultivated yet boring DJ-tool, but pitches those qualities of techno, which got us all going in the first place. Passion, surprise and the never-ending strive to push both the human being and the machines to the limit. This undoubtedly exquisite techno night will be started and closed off by our residents. Spacid will be warming up the crowd and Kr!z will make sure you go home satisfied.